The CoffeeShop Blog: CoffeeShop "Vintage Valentine" Digital Paper Pack! 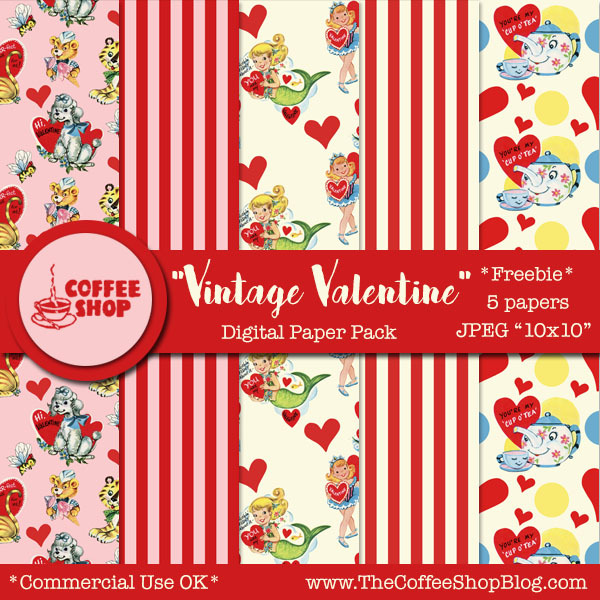 CoffeeShop "Vintage Valentine" Digital Paper Pack! Happy Friday! Today I have a fun little digital paper pack with vintage valentines from The Graphics Fairy Premium Site. Karen of The Graphic Fairy generously gave me a free month on The Graphics Fairy Premium Site so I could review it for you. And I am in awe! I have been using the amazing free graphics from her blog for years, but her premium site blows me away. The designs are amazing, the tutorials are detailed and very useful, and The Graphics Fairy has some of the best commercial-terms-of use out there. I am going to post a complete review next week. I hope you enjoy using these new papers in your own designs! Download the CoffeeShop "Vintage Valentine" Digital Paper Pack. You can also download it here. Hey I know this may be a stupid question but do you know if I would be able to use this designs for a free printable on my blog ? Just curious cause I'm not too sure since you said you were using clip art from the graphics fairy ? Kazzedesigns, you are so welcome!!! Thanks for the vintage Valentine paper. It's adorable! I love the Graphics Fairy too.